This powerful Retinol concentrate transforms your favorite moisturizer or serum, allowing you to customize the strength you need to treat multiple signs of aging or an uneven skin tone. Blend of 1% stabilized Retinol and antioxidants stimulates collagen production and repairs past damage for firmer skin. Soothing Willow Herb and anti-inflammatories calm skin. Lightweight fluid is ideal for mixing into any serum or moisturizer. 1% Retinol Booster is a concentrate that makes it easy to customize the anti-aging, wrinkle-smoothing and skin-firming strength of your favorite moisturizer or serum, whenever you need it. 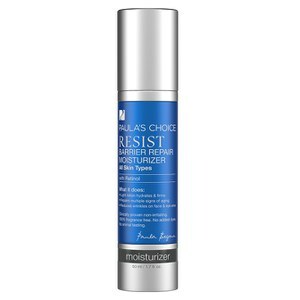 The Resist 1% Retinol Booster is specially formulated, without oils, heavy emollients or silicones, so it blends seamlessly with any serum or moisturizer. Powerhouse ingredient Retinol is joined by several proven anti-aging ingredients to stimulate collagen, help repair past damage and provide smoother, dramatically younger-looking skin. 1% Retinol Booster is especially for those who want the benefits of retinol without having to change their skincare routine. 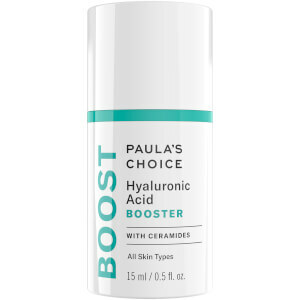 Ideal for anyone concerned with improving the appearance of skin showing signs of sun damage, including deeper wrinkles, brown spots, uneven skin tone and loss of firmness. 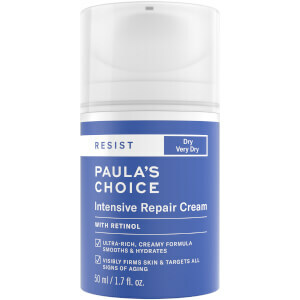 Also excellent for those struggling with breakouts (aka "adult acne"). Apply once or twice daily after cleansing, toning and exfoliating. Dispense your desired strength of Resist Retinol Booster (by number of drops) into your favorite moisturizer or serum and apply as usual. For daytime, follow with a broad-spectrum sunscreen rated SPF 25 or greater. May be applied around the under-eye area. Avoid eyelids and lips. Water (Aqua), Glycereth-7 Triacetate, Glycerin, Carthamus Tinctorius (Safflower), Isopentyldiol, Polyglyceryl-10 Behenate/Eicosadioate, Butylene Glycol, Pyrus Malus (Apple) Fruit Extract, Polysorbate 20, Retinol, Glycyrrhiza Glabra (Licorice) Root Extract, Ceramide 3, Palmitoyl Tripeptide-1, Avena Sativa (Oat) Kernel Extract, Epilobium Angustifolium Flower/Leaf/Stem Extract, Arctium Lappa Root Extract, Salix Alba (Willow) Bark Extract, Allantoin, Dipotassium Glycyrrhizate, Caprylyl Glycol, Polyglyceryl-10 Laurate, Dipentaerythrityl Tri-Polyhydroxystearate, Ethylhexyl Methoxycrylene, Hydrogenated Lecithin, Bis-Glyceryl Ascorbate, Disodium EDTA, Sorbic Acid, Xanthan Gum, Phenoxyethanol.